Explanation: Sometimes land and sky are both busy and beautiful. The landscape pictured in the foreground encompasses Bryce Canyon in Utah, USA, famous for its many interesting rock structures eroded over millions of years. The featured skyscape, photogenic in its own right, encompasses the arching central disk of our Milky Way Galaxy, the short streaks of three passing planes near the horizon, at least four long streaks that are likely Eta Aquariid meteors, and many stars including the three bright stars that make up the Summer Triangle. 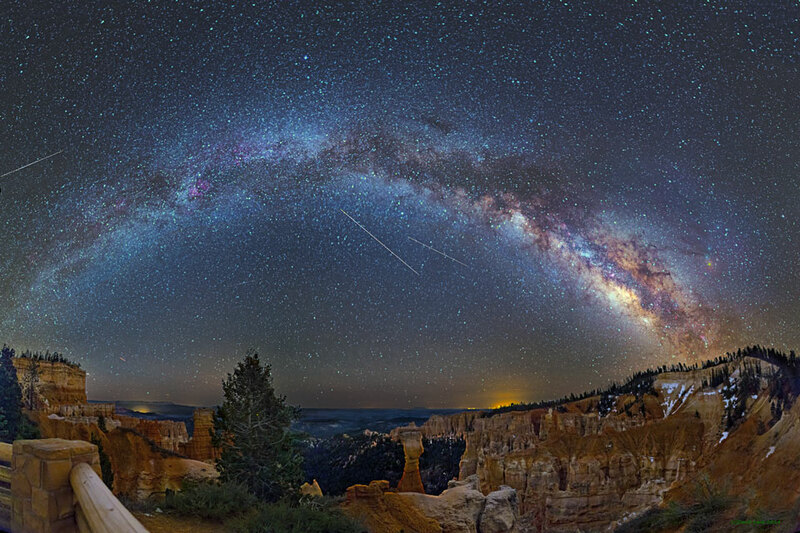 The featured image is a digital panorama created from 12 smaller images during this date in 2014. Recurring every year, yesterday and tonight mark the peak of this year's Eta Aquriids meteor shower, where a patient observer with dark skies and dark-adapted eyes might expect to see a meteor every few minutes.